Bruce Anderson is the long time editor and publisher of Mendocino County’s Anderson Valley Advertiser. Volume 1 of The Mendocino Papers has been published and is the first in a series. 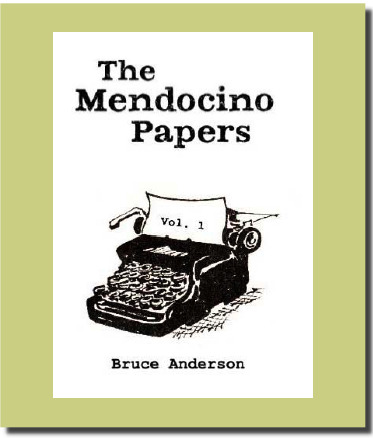 Anderson’s anecdotal history of Mendocino County is mixed with colorful and humorous autobiographical memoirs beginning in 1970 when Anderson was part of the hippie generation who settled in the Anderson Valley. Anderson, who is not related to the original Anderson Family that first arrived in Anderson Valley in the 1800s, is a controversial figure in the Anderson Valley. He has been labeled a grump and has outraged local politicians and bureaucrats, but is an Anderson Valley original. This is not a wine book, but is a good read if you are interested in the history of the Mendocino region and some of its nefarious characters such as Charles Manson and Jim Jones. Available from the author for $20. Mail your order to AVA, Box 459, Boonville, CA 95415.